Buying swimming pool liners certainly isn´t rocket science, but there are still a few things that you should consider. You´re not going to have the most excitement buying pool liners or pool replacement liners either, but it´s an important aspect of your pool´s construction and buying the right pool liner secures the longevity of your pool so that you get years of enjoyment from it. Likewise, the variety of pool liners for above ground pools and in-ground pools is much more impressive today than it was in the past. Gone are the days of the plain blue pool liners. There are a wide range of styles of above ground and in-ground pool liners so you should select your new liner carefully. Apart from aesthetic, there are some more practical factors to consider about pool liners for inground swimming pools and above ground pools as well. The gauge, or thickness, of pool linerswill obviously have an effect on the durability of the liner. The standard gauge for pool liners is around 20 milimeters, but you should consider investing in a thicker swimming pool liner if you expect overzealous swimmers. Likewise, thicker liners provide more protection from the sun. Swimming pool liners are obviously essential for enhancing the durability of your pool and they can also provide a new element of style to your pool. There are a multitude of good reasons to buy swimming pool liners. 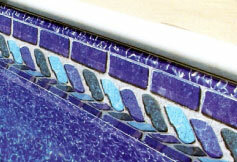 The quality of modern pool liners provides a comfortable surface for swimmers that also protects your pool. Above ground pool liners are especially effective for extending the life of your pool by strengthening and protecting the structure of the pool. Inground pool liners, as well as above ground pool liners are usually easy to clean and help to maintain the clarity of your pool water. Nevertheless, no matter how much pool liners improve the quality and durability of your pool, their main feature is their ability to let you define the style of your pool and yard. Different colors and patterns can drastically affect the atmosphere of your yard and the pool environment. Indeed, swimming pool replacement liners are one of the easiest and most cost effective ways to give your pool a makeover.